This first image shows one of the test subjects in full light. Throughout the day, the body gives off weak emissions of visible light in totally dark conditions, as the color-coded middle image shows. 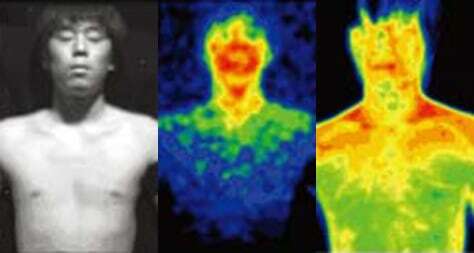 The rightmost image of the subject, captured in infrared wavelengths, shows the heat emissions.